Employee Incentives and Employee Recognition are used to achieve certain objectives, but they're not the same. Unfortunately, these two terms are used interchangeably and could cause you to miss your overall objectives if you don’t appreciate the differences. 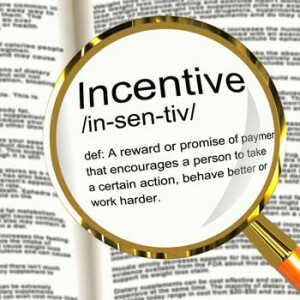 We all know the employee recognition definition, but what does incentive mean? Workplace incentives and employee recognition programs are important tools, and when combined you can get tremendous benefits to your organization. Let's define what is (1) an Incentive, (2) what is Recognition, and (3) the combination of both. Who uses Employee Incentive and Recognition Programs? Why Use Incentive or Employee Recognition Programs - what's the value? What are the most common types of programs? When management asks you to create a new employee incentive program, how should you get started? We know that employee incentives have the potential to help almost any organization accomplish its business objectives. Incentive programs can help motivate, encourage, and reinforce behaviors you want repeated and can significantly improve employee morale. Read on to learn more about this important tool, and see how to get started.